Zac Griffith, Our first Keto Athlete! Zac has been following the keto diet for about 8 months now so we decided to ask him a few questions to get to know him a little better! When looking for our first keto athlete to spotlight, my first instinct was to ask my husband. And the first name he gave me, right off the bat, Zac Griffith. I had never heard of him, or so I thought. I had actually been listening to him in the background for months and months, as my husband watched his hunting videos. 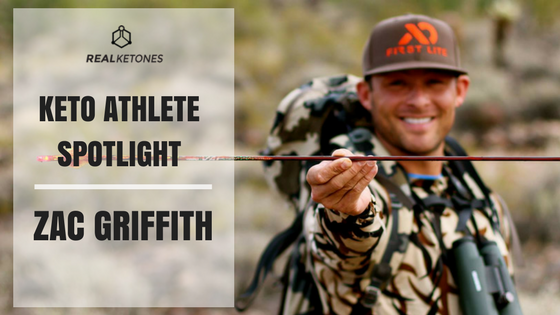 Zac Griffith is a photojournalist, hunter, athlete, husband, and father. He grew up hunting in the Wasatch Mountains, and has used his talents for video and film to create beautiful videos. You can check out some of his work HERE. Even if you have never had in interest in hunting, watch his videos. It is clear he has a passion for what he does, and the places he travels to are breathtaking. To read Zac's full bio, click here. Zac has been following the keto diet for about 8 months now, and is having great success! We decided to ask him a few questions to get to know him a little better. I started keto in Feb 2017. I've always closely monitored my caloric intake and have competed in several body building competitions and triathlons. Fueling performance and attaining a certain physique has always been my motivator behind diets. The keto approach was unlike any diet I had ever tried. I was extremely interested in seeing how my body reacted to it. What advice would you give to someone just beginning the keto diet? Keep it simple and don't stress about the little details. If your macros aren't perfect, then make adjustments and continue down the path. It's a process and as long as you are aware and cognizant of how your body is responding you will be able to make small adjustments and yield greater results. What do you crave most on the keto diet? How has the keto diet affected your hunting game? Keto has enabled me to hike further/longer without constantly stopping to eat and re-hyrdrate. The energy seems more sustained and consistent and the less time I spend eating the more time I have to focus on the task at hand! What does a typical day of eating look like for you while following the keto diet? Two meals a day. 2,000-4,000 calories each staying within 70% Fat, 20% Protein and 10% Carbs. I eat more when I train larger muscle groups or hike extensively. Have you always been athletic? Did you play sports in high school? What does your fitness regime typically consist of? I lift weights 6 days a week (even during hunting season). Hike/hunt a minimum of three times a week and do 30-45 min of cardio every day I don't hunt. What does the typical day on the mountain look like for you? Most of my hikes are 1-2 hours. I like to start hiking early enough to have an hour minimum before sunrise to eat and get changed into my gear. Pack with camera gear, optics, food and water is usually 30-40 pounds. Most of my hikes are extremely rugged/steep country so depending on exertion I will bump calories by 2-4,000 daily as needed. What do you love most about hunting? The challenge: "You Vs. You" Overcoming your doubts, training to be able to accomplish more and go further. I love filming and watching wildlife. I love training. I am able to accomplish both every day on the mountain! What is your proudest hunting moment? Watching my wife take her first buck. Check out Zac's Vlog on Cutting with Keto! To check out the full article on Zac for out Keto Athlete, click here!